Confessions of An Asperger's Mom: Silly Rabbit...Trix are for Kids! 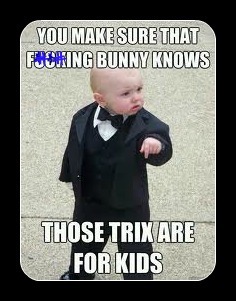 Silly Rabbit...Trix are for Kids! There are no secrets in our house. Even things that are supposed to be kept secret sooner or later come out. Why? Well number one, I live with some very nosey people (including my mother). Two, because no one can hold water! With the boys, and most of the time with my husband, if it comes to mind they say it or ask it. Somethings...I really don't want to know. "Mom, why are you putting on that makeup? No one looks at you." -Slim (my oldest) Yeah...lovely! Red also asks me the funniest questions, "Mom...Why do you think I'm so lazy?" Wow! He actually admits to being lazy. Part of it is just being a teenage boy. He doesn't want to do chores. Doesn't want to do homework. Barely wants to take a shower. Yet, he wants us to give the best of everything. Boy is he going to be in for a rude awakening when real adult life sneaks up and slaps him in the face! I do think he's lazy. However, I don't want him to know that. Unfortunately, I can see my lack of follow-thru in him. At his age, I only wanted to do enough to get by, especially if it wasn't a subject I was thrilled about i.e. Algebra or History. However, if I loved the subject I would give it my all 110% i.e. English, Composition and Yearbook. I did what I had to do to pass, but I certainly did not enjoy it or try to excel in it. I do however, give my all to any job I have now, especially motherhood. His dad and his brother are two of the hardest working people I know, so I can't blame this one on Dad. This was my response to the lazy question. "You're not lazy. You only what to do what YOU WANT to do. If it's not fun...or interesting to you, you don't want to do it. It's all about MOTIVATION." (Of which he has very little.) I pray that it will show itself in him eventually. I still thought it was pretty funny that he actually asked the question. His eyes barely open this morning, as I try to wake him he asks, "Why do I have to be forced to go to school? And why does America care about it?" Obviously, he either went to sleep thinking about this or he dreamed about it. He wasn't even fully awake. "You have to go to school because America doesn't want a bunch of criminals who have no education or jobs running around the streets. The government doesn't want to take care of people with no education...and neither do I. So get up!" Yesterday Blue, comes to me and says, "I have autism right? Autism is a neurological condition, so why don't I see a Neurologist?" Wow! I'm blown away by this one. It turns out he was talking to a friend who is also on the spectrum, who does see a Neurologist. I received Blue's diagnoses after getting Red's. I realized that they have many of same traits, although in many ways they are very different. We see a Psychologist and a Psychiatrist, but it's been difficult to get into to see a pediatric Neurologist. I finally have an appointment coming up this month. I made this appointment 6 months ago. I want a second opinion with regards to treatment for the boys. The trial and error process of medications to "help" with depression and outbursts is frustrating. I am hoping to get some new insight and suggestions on ways to help them manage. I guess Blue wants to make sure I'm on the job. My kids may asks a lot of questions and say a lot of unexpected things. One thing for sure...they keep me on my toes.